Item Cards: Adventure Gear allows players to track mundane items just like they've been tracking their magic items. In response to popular demand from players, Paizo has created a deck of 54 non-random item cards covering everyday adventuring items. 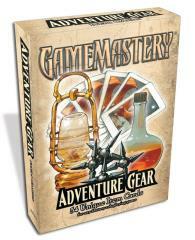 Useable in ANY fantasy roleplaying game, Adventure Gear is the perfect player accessory! Never again will you forget how many torches you’re carrying, whether you packed those caltrops, or who has the rope. You ain't got it 'til you get it!